40 pcs. 0,25 EUR ea. from 120 pcs. 0,21 EUR ea. from 280 pcs. 0,19 EUR ea. from 640 pcs. 0,17 EUR ea. A convenient solution if you want to glue on a block magnet. 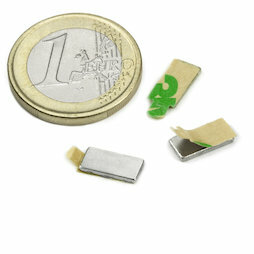 This is a very flat block magnet (10 mm long, 5 mm wide, 1 mm thin) with a self-adhesive side. Just remove the film, stick it on and your smart mailing or creative arts project is done. You can also use the Q-10-05-01-STIC to hang up pictures without piercing holes in them. Ordering 40 means you'll receive 20 magnet pairs! 10 pcs. 0,88 EUR ea. One sales unit contains a strip of 20 pairs, meaning 40 individual magnets. If you order 40 pieces in the shop, you receive a strip like the one in the picture. Pretty and flexible: The Q-10-05-01-STIC holds pictures with no problem - here on a wall with magnetic paint. The Q-10-05-01-STIC is also suitable for creating extensive mailings or press kits: Glue a magnet on one side.